HP OmniGo 100 palmtop with touchscreen. This is a Singapore designed clamshell palmtop with an innovative hinge structure which enables it to be folded 360 degrees to form a pen operated notepad. True pocket size isn't compatible with a keyboard, but it is pretty small, at 152mm (6") by 95mm (3.7") by 23mm (0.9") thick, giving a volume of 332 cc. The weight is about 300 gram. I was pretty impressed by the small size, although you would have problems slipping it in some pockets. A stylus is carried in the body for pen input. Pen input is by using the Grafitti alphabet, and works reasonably well and quickly, with few of the recognition problems of the Newton Message Pad 110. Unlike the USR Pilot, pen input can be written anywhere on the display, and the final text will appear at the cursor. The texture of the screen is much better for use with a stylus than is the Newton Message Pad 110. Despite the advantages of text entry anywhere on screen, there are some problems with this mode. You can manage to invoke some of the meta commands, like cut and replace, which messes up your input. Also, doing any form of punctuation seems a right pain, so I tend to end up not using punctuation. You can pop up a grafitti window, and this has text and number and caps buttons, and allows much easier entry of punctuation. However it is often in the way of your text, so you end up doing a lot more scrolling. or dragging the window out of the way. Two Lithium AA batteries are supplied, and these fit in the hinge area, similar to the Psion. A Lithium backup battery is also supplied. You can use alkaline batteries, with some loss of battery life. There is no provision for rechargeable batteries. Nor is there any external power supply, a lack I find utterly amazing. The power consumption is distressing. I figured I got less that 15 hours from Lithium AA cells. With standard carbon cells, one week of storage dropped the power to almost half, and that wasn't even using the OmniGo. The display is a 240 pixel by 240 pixel LCD, a total of 57,600 pixels. The display size is a tiny 60mm square, or 95mm diagonal. This is a very small proportion of the case size, but does allow the OmniGo 100 to have an easily rotated display. When rotated for vertical display, the keyboard is disabled, and input is only by stylus. LCD contrast adjustment is via software from the main menu screen. I'm not very impressed with the display, which requires good light before I can read it. In even partly poor light, the display is unreadable. This is the worst palmtop display I've used, and in my opinion, makes the entire machine close to useless for anyone with less than perfect eyesight. As with most palmtops, the qwerty keyboard occupies almost all the body size. The key spacing is a tiny 13mm (a standard IBM computer keyboard is 19mm), and the keys are tiny calculator style, with a considerable space around each. There are 67 keys. No numeric keypad. The cursor keys are in inverse T, and the Fn key is used to access home, end, and pg up and pg dn. There are only 5 function keys. Although there is an Alt key, there is no Ctrl key. The Jotter application and the main Menu have their own special wake-up keys. The good spacing around keys should help those with larger fingers. I preferred the Psion keyboard, despite even less space between keys, however tastes will obviously vary. In palmtops, you need to try out the keyboards. The processor is a 14 MHz 8086 style, however the Geos graphics applications take a fair while to come up, so the device feels unacceptable slow to me. Memory is 1 megabyte, of which about 400 kb are initially available for user material. Running applications seems to grab a lot of memory, so after a short while you seem to have closer to 300 kb available for your data. Given that a 1 megabyte Psion gave you over 800 kb of data space, I was not impressed. On the other hand, you can use standard PCMCIA SRAM cards with the OmniGo. A Type 2 PCMCIA card slot is included. The system does not include PC Card Socket Services, however 1 MB and 2 MB SRAM cards from FDK, Grid, Apple Newton and other systems worked fine. Flash memory cards from a Newton are not supported, however there are reports of ways to use them. Although I could readily save OmniGo material on a PCMCIA card, and could read the file structure from the card, I could not extract any data. The OmniGo Geos applications have their own data structures, which were not compatible with anything on my PC. Although I have GeoWorks on my PC, it could not read Geos files from the OmniGo. I was not impressed by this. There is no provision for an external floppy drive or hard disk. There is a non-standard 10 pin serial connector, however no cable is supplied. Nor does the standard system appear to have much communications software. A communication package of serial cable and Windows software is available for A$190. I feel this price is excessive (actually, I think it is outright gouging, considering the cable is a simple one). The annoyingly non-standard serial port on the OmniGo is a 2mm dual row 10 pin connector, as made by AMP, 3M and others (if you can find them). US folks can buy one from Digi-Key (1-800-344-4539) as P/N H2031-ND for 99 cents. You do need to know how to use a soldering iron. Sooner or later I'll find a similar connector in Australia and make up my own cable. Gordon Hlavenka (cgordon@vpnet.chi.il.us says the layout is below. Clement Resanka (e9525967 student.tuwien.ac.at) says it is otherwise. I can't see any way to reconcile these two layouts, so if anyone has more details, please let me know. As an alternative to the HP Conn Pack Hot Sync software, a number of owners use omnicom, which comes with the IZL runtime shareware to backup their data, however they can not modify it. The HP Conn Pack Hot Sync package provides PC versions of Appointment Book, Phone Book and NotePad, plus conversion to some "standard" formats. Problems include no alarms on the PC, bugs in the Appointment Book, can't see both text and ink in NotePad. An excellent A5 size Quick Start And User's Reference Guide is supplied. The 17 chapters total at least 230 pages, the table of contents are nearly 7 pages, and the index is 11 pages. There are screen displays on practically every page. A handy Graffiti reference card is included. A thirty page Organizer Extras advertising supplement is included, listing about one package per page. The OmniGo includes a nice set of organiser functions running under the Geos graphical interface. It includes a calendar (day, week, month, four month views), a prioritised to-do list, a book reader, solitaire game, a data base which includes an example phone list. There is a spreadsheet, a note jotter and a notepad. The notepad is close to useless, as it seems to fail at only a few hundred lines of text. Material can be stored as text, or as drawings. There is an HP12C financial calculator included, together with a number of financial functions such as loan amortisation, interest calculations, cash flow, conversion routines of various types, and statistical functions, including graphing. The supplied software seemed pretty good, and was let down mostly by its lack of speed. The model I checked was S/N SG54509285, from Paws Products. John Feras produced a language called IZL, details obtainable from http://www.netaxs.com/~jferas/izl.htm. You can also obtain Omnicom, an install program. 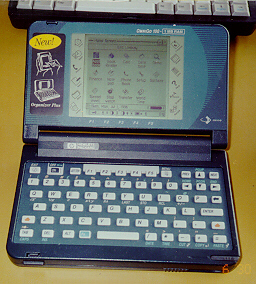 This model uses a reflective display developed by Polaroid (also used in the Motorola Envoy 150). It is highly reflective, and is intended to provide a much greater contrast. In some lights, it looks almost backlit. HP also supply the popular Pocket Quicken banking package in RAM (so make a backup copy). As well they have Clip and Go to allow MS Windows clipboard material to be copied. Price went up from US$349 to US$429. Here are a few other OmniGo sites, somewhat more positive than my review.